This post, Branches of Linguistics (with Definitions, Explanations and Examples), sheds light on what linguistics, as a field of study, is. Linguistics is the scientific study of language. In order to study language at a closer level, scholars have broken down linguistics into various branches for easy study. We also refer to this as levels of language study. It is systematic; that is, it possesses structure. Language is systematic, structured, patterned – it has rules and principles. We use language in the process of interaction: it is a unique attribute of man (it is exclusively human), it is human-specie specific. Semanticity – language is meaningful because words have meanings. Vocal-auditory channel—signal modality involves vocalization and sound perception. Broadcast transmission—everyone in earshot can hear what is said. Rapid fading—signals fade quickly, and do not ‘clog the airwaves’. Interchangeability—any speaker can also be a listener and vice versa. Total feedback—speakers can hear everything that they say. Specialisation (speech as ‘trigger’)—linguistic signals accomplish their results not via raw energy (as in pushing or biting) but by their fit to the receiver’s perceptual and cognitive systems. Semanticity—some linguistic units have specific meanings (words or morphemes). Arbitrariness—meanings are generally arbitrarily related to signals, rather than iconic. Discreteness—each utterance differs from all others discretely (by at least a distinctive feature). Displacement—meanings about past, future or distant referents can be encoded and understood. Productivity/openness—new utterances can be readily coined and understood. Duality of patterning—meaningless units (phonemes) are combined into meaningful ones (morphemes), which can then be combined into larger meaningful units (sentences). Prevarication—it is possible to lie. Reflexivity—it is possible to use language to talk about language. Learnability—it is possible for a speaker of one language to learn additional languages. You may wonder if there is any distinction at all; but there is! Language is a general notion, an abstract concept in the mind and a universal phenomenon. A language, on its own part, is a specific instance or manifestation of the phenomenon known as language. Psycholinguistics, one of the branches of linguistics, as a branch of cognitive science, investigates how we acquire language, how we produce language and how we acquire language. In other words, Psycholinguistics examines language acquisition, language production and language comprehension. It is the study mental aspects of language and speech. It looks critically into how we represent and process language in the brain. Alan Garnham, in his book Psycholinguistics: Central Topics, defines Psycholinguistics as “the study of the mental mechanisms that make it possible for people to use language. It is a scientific discipline whose goal is a coherent theory of the way in which language is produced and understood.” Psycholinguistics is a branch of both linguistics and psychology. The American psychologist, Jacob Robert Kantor introduced the term ‘Psycholinguistics’ in his book, An Objective Psychology of Grammar, published in 1936. What knowledge of language do we need to use language? Other lexical relations include: polysemy, hyponymy, taxonyms, holonyms, meronyms, figures of speech or tropes, etc. it is important to note that we can describe all semantic relationships in all languages based on similarity or contiguity. Pragmatics, which is one of the interesting branches of linguistics, has to deal meaning beyond the surface level; that is, it engages meaning beyond the literal level. Pragmatics highlights the study of meaning in the interactional context. As language is an instrument of interaction, Pragmatics focuses on what implied meanings, that is what people mean when they make use of language. Semantics deals with what a word means while Pragmatics deals with what is meant by a word. Pragmatics has more to do with what a speaker means by a word rather than what the word means in itself. ‘Will you pass the salt? So in asking the question, the speaker is simply directing the listener to pass the salt. This is what J. L. Austin deals with in his seminal book, How to do Things with Words. This brach of linguistics has to do with the study of signs and sign-using behaviour. One of its founders, Ferdinand de Saussure, defines it as the study of ‘the life of signs within society’. Another major proponent of Semiotics is Charles Sanders Peirce. Peirce defines a sign as “something which stands to somebody for something”. He believes that a sign can never have a fixed meaning because we have to constantly qualify what meaning means. (See the Meaning of meaning). An icon is that which looks almost exactly (if not exactly) like what is refers to. It is a picture or symbol which we recognise universally to be representative of something. It is a word or sign which stands for something else. Examples includes pictures in different forms, a road sign for falling rocks, the Roman numeral ‘II’ representing the number two (2), etc. An index is an indicator or sign of something. We associated an index with its referent. For instance, smoke is a sign of fire, dark clouds are indexical of imminent rainfall, a signpost or signboard is pointer or an index of a particular location. A symbol is something that stands for or represents something else, especially an object representing an abstraction or a concept; it is a sign with a specific meaning: a written or printed sign or character that represents something in a specific context. Note that a symbol relates to its referent only by convention (this is why we say language is conventional because there is no relationship between the signified (the concept or idea behind the sign) and the signifier (a set of speech sounds or marks on a page); it is a matter of convention. Socio-cultural contexts also determine what is symbolic and what is not. Modern semioticians who have applied Peirce and Saussure’s principles to a variety of fields, such as aesthetics, anthropology, psychoanalysis, communications, semantics, etc. include these leading scholars: Claude Lévi-Strauss, Jacques Lacan, Michel Foucault, Jacques Derrida, Roland Barthes, Julia Kristeva and others. The discussions on branches of linguistics will not be complete without grammar. Grammatical level deals with the morphology and the syntax of a language. The traditional grammar is the earliest form developed by Socrates, Aristotle and Plato. They invented the Parts of Speech and came up with definitions, they are the Prescriptive School. They defined grammar as a body of prescribed rules which is aimed at guiding the use of a language. A school later came up, the empiricist movement, which gave birth to the Structural grammar who based their argument on what is observed and not what is defined. They were averse to prescribing and favours describing descriptive grammar as against prescriptive grammar. Morphology is a branch of linguistics which deals with the study of words; precisely the study of the internal structure of words. The term originates from the Greek and it deals with ‘morph’ which means ‘shape’ or ‘form’. Morphology is a branch of linguistics that came into existence in 1859. The German linguist, August Schleicher, first made use of the term to describe the study of the form of words. Morphology deals with word formation out of morphemes. It is the study and description of word formation (such as inflection, derivation, and compounding) in language; it is the system of word-forming elements and processes in a language. Morphemes are the building blocks of morphology and they are the smallest meaning-bearing units of language (O’Grady, 1997). Read more in this post on Morphemes. Edward J. Vajda informs us that ‘Syntax’ is a derivative of the Greek word syntaxis, which means arrangement. Syntax deals with phrase and sentence formation out of words. Syntax is the study of the arrangement of words in sentences, clauses, and phrases; it is also the study of the formation of sentences and the relationship between their component parts. A major concern of syntax is ‘word order’ which is a main device for showing the relationship among words. Usually, the subject comes first in a sentence; the verbs follows and the object or complement follows the verb. (See Patterns of the English Sentence) and (The Syntactic Elements of the Clause Structure). When the order changes, it may affect the meaning of the utterance. Syntax is the grammar, structure, or order of the elements in a language statement. In essence, syntax is the way in which we put linguistic elements together to form constituents such as phrases or clauses. We also refer to the part of grammar dealing with this as syntax. In a sentence, syntax tells us which word comes before and after another word. Syntax deals with arrangement of words to form meaningful sentences. Sociolinguistics is an interface between sociology and linguistics or language and the society. This accounts for the definition of sociolinguistics as the study of patterns and variations in language within a society or community. Sociolinguistics, another branch of linguistics, focuses on the way people use language to express social class, group status, gender, or ethnicity, and it looks at how they make choices about the form of language they use. It also examines the way people use language to negotiate their roles in a society and to achieve positions of power. Sociolinguistics also deals with the assignment of roles to various languages that exist in a speech community such as First Language, Official Language, National Language, etc. This branch of linguistics is the study of language of sentences; the analysis of features of language that extend beyond the limits of a sentence. A scholar suggests that the term discourse analysis is very ambiguous. According to him, Discourse Analysis “refer mainly to the linguistic analysis of naturally occurring connected speech or written discourse.” Explaining further, discourse analysis “refers to attempts to study the organisation of language above the sentence or above the clause, and therefore to study larger linguistic units, such as conversational exchanges or written texts.” Discourse Analysis takes linguistic enquiry beyond the clause-bound ‘objects’ of grammar and semantics to the level of analysing ‘utterances’, ‘texts’ and ‘speech events’. It engages itself with meaning that cannot be located in the ‘linguistic system’. Discourse Analysis deals with language use in social contexts; and in particular with interaction or dialogue between speakers. Please use the toilet, not the pool. If these two sentences are read separately, they might seem reasonable; but when we take them together as a single discourse, we will have to check again the interpretation of the first sentence having read the second sentence. This is what discourse analysts do. Rechecking the first sentence to properly determine its meaning is known in Discourse Analysis as Reframing. This is one of the most interesting branches of linguistics that explores the linguistic choices available to users of language in a particular language. We cannot talk about stylistics without talking about style. Stylistics is the study of textual meaning. It arose from the Russian formalist approach to literary meaning. Stylistics deals with style and its consequent meaning. Stylistics is the study of linguistic styles in a language. It is the use of linguistic tools to arrive at the meaning of an utterance or a text. Stylistics explores how readers interact with the language of (mainly literary) texts in order to explain how we understand, and how texts affect us when we read them. Stylistics is also the study of the devices in languages (such as rhetorical figures and syntactical patterns) that are considered to produce expressive or literary style. Modern stylistics makes use of the tools of formal linguistic analysis alongside methods of literary criticism and the goal is to try to isolate characteristic uses and functions of language and rhetoric rather than advance normative or prescriptive rules and patterns. Phonology, a major branch of linguistics, deals with sounds of a language. It is the study of the patterns of sounds in a language. It deals with how speech sounds are organised and used in a language; especially how the sounds are organised in the mind and how they are used to convey meaning. The phonological system of a language has to do with two basic foci: the inventory of sounds and their features and the rules which govern how sounds interact with one another. Phonology is related to other branches of linguistics like phonetics, morphology, syntax, semantics and pragmatics. Phonology is different from phonetics. Phonetics analyses the production or articulation of speech sounds irrespective of the language, but phonology analyses the sound patterns of a particular language. Phonetics is concerned with the physical properties of sounds while phonology deals more with how the sounds function in a language. There are some other aspects to Phonology which study specific things. These include: Generative Phonology, Auto-segmental Phonology, Metrical Phonology, Lexical Phonology, etc. The person who specialises in Phonology is a Phonologist. Phonetics, closely related with phonology, is another important branch of linguistics that studies speech sounds. It deals with how we produce speech sounds and how we perceive speech sounds. There are three major aspects to the study of phonetics: articulatory phonetics (the exploration of how the human vocal tract or apparatus produce speech sound, the way the articulators or speech organs interact together to produce sounds); acoustic phonetics (studies the sound waves the human vocal apparatuses produce; it deals with the physical or acoustic properties of speech sounds) and auditory phonetics (this studies or determines how the human ear perceives speech sounds which the articulators produce). There are other posts on this site that focus specifically on some of these branches of linguistics in a more detailed manner. You can check them out. 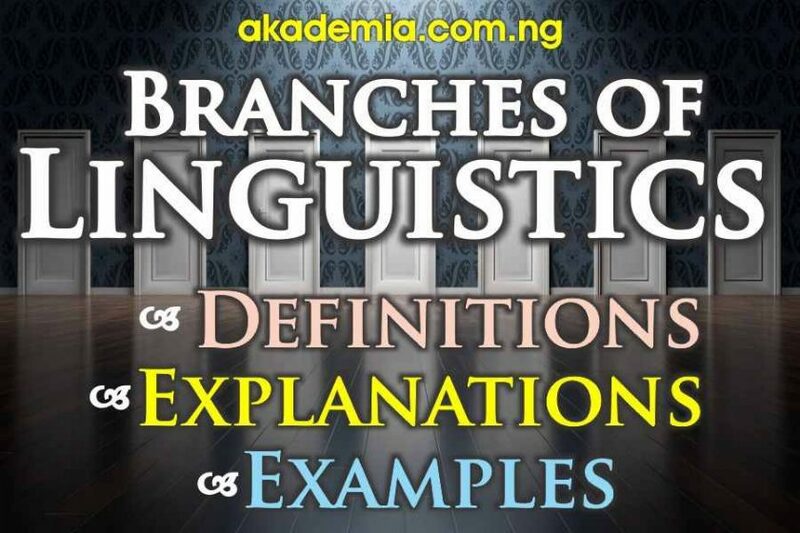 This post, Branches of Linguistics (with Definitions, Explanations and Examples), considers various aspects and branches of linguistics; core linguistics and applied linguistics alike. It focuses on what language is and its features and the various levels at which we study it. Do someone a world of good by sharing this post with them. Many students of English will need this post; do share it with them. I am sure you have learned something definite in this post. Check out other educative posts on Akademia. See you around. Hockett C. F. (1960). Logical considerations in the study of animal communication. In Animal sounds and communication (eds. Lanyon W. E., Tavolga W. N., editors. ), pp. 392–430 Washington, DC: American Institute of Biological Sciences. Pragmatic, semiotics, index, symbol, grammar, syntax, stylistic, phonology. I have really learned. Thanks so much sir for the knowledge. What an educative post. Ihave really learn because it explain the meaning, branches and examples. I HOPE SOMEONE SEES THIS POST BECAUSE IT IS VERY IMPORTANT. BY THE WAY, THANKS SO MUCH.